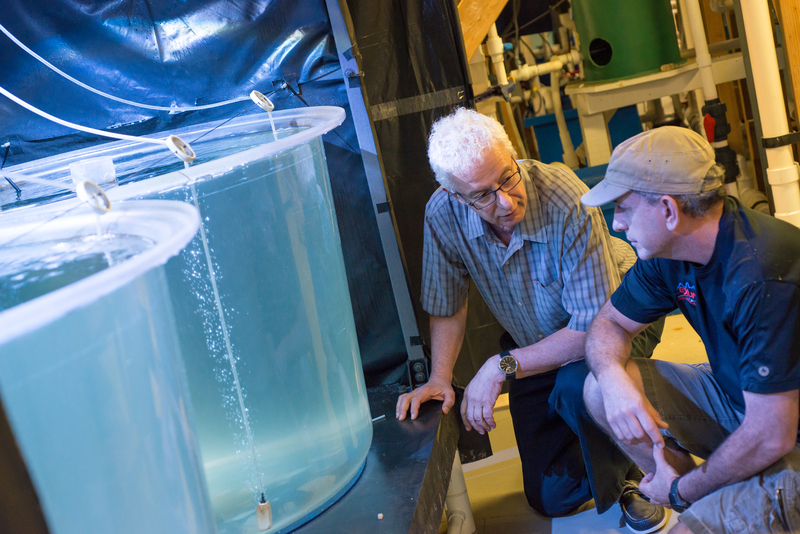 UMBC Professor Yonathan Zohar, chair of marine biotechnology, is featured in a new issue of The Economist focused on the future or agricultural technologies. Zohar’s research seeks to revolutionize the fish farming industry, removing many of the pitfalls of conventional methods and increasing environmental sustainability. Zohar’s marine aquaculture system is land-based and completely self-contained, and it could dramatically change how millions of people access fish as a local food source. “Fresh fish…would…become accessible to millions of landlubbers who must now have their fish shipped in from afar, deep-frozen,” writes Geoff Carr. “Old world species like sea bream and sea bass…could be delivered fresh to the table anywhere” without the threats of nonnative species escaping into local waters or wild fish being exposed to pathogens found in open water. Localized systems reduce transportation costs and energy usage, and Zohar’s system includes several core features to maximize sustainability. The system puts bacteria to work to convert waste from the growing fish into either reusable or harmless compounds. Two sets of bacteria work in tandem to convert ammonia excreted by fish into inert nitrogen gas. A third set converts solid waste into methane that is put back to use powering the aquaculture operation. “The upshot is a closed system that can be set up anywhere, generates no pollution and can be kept disease-free,” writes Carr. Yoni Zohar (l) and Jorge Gomezjurado (r) watching bluefin tuna larvae at IMET aquaculture research facility. Zohar has learned the hard way that it is difficult to grow in captivity some species that consumers most value, like bluefin tuna, yellowtail, and other marine fish. The system he and his colleagues have built at the Institute of Marine and Environmental Technology (IMET) enables fish to thrive, particularly in the early stages of life, by carefully mimicking factors like temperature, salinity, and oxygen conditions found in the species’ natural habitats. However, the optimal conditions initiating reproduction and nurturing juvenile fish to adulthood have proven more challenging to replicate. “[Zohar] has spent decades studying the hormone system that triggers spawning and can now stimulate it on demand,” writes Carr. He has also carefully researched the needs of freshly-hatched larvae, and he is now focused on developing methods to effectively and reliably raise Bluefin tuna into adulthood. Photos by Marlayna Demond ’11.